In a fractured and war-torn country, a renowned knight and warlord named Allystaire Coldbourne walks away from his privileged position and into exile amidst the ruins he's spent a lifetime making. In the smoking remains of a village, he finds an improbable survivor, the young girl Mol. Against his better judgment, she convinces Allystaire to pursue the men who leveled her village and have kidnapped her kin. He follows their trail to a town of pirates and fugitives, unaware that he's taking the first steps on a storied but treacherous path; towards his Ordination as a holy knight of legend, a Paladin. But to fulfill this role, he – and the unexpected allies he finds along the way – must face the sorcerous evil that stalks the land, the wrath of gods and men, and his own dark past. 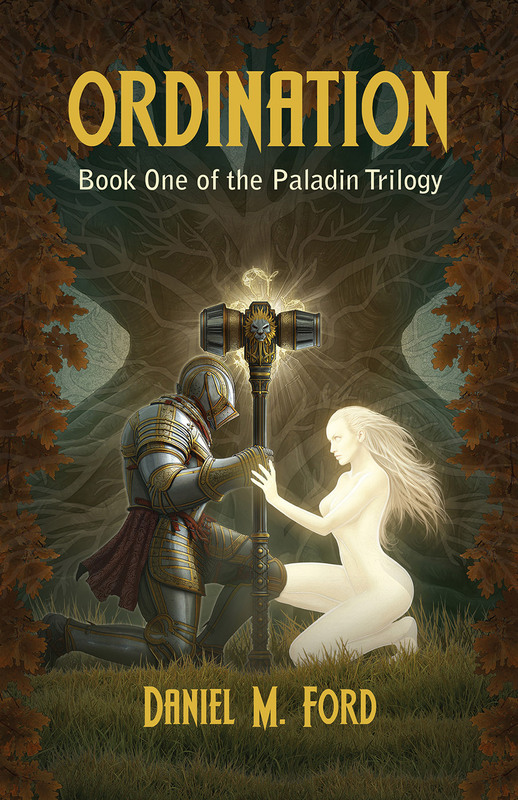 Paladin: Ordination will be available worldwide on June 1 2016, from SFWP. I had not thought to take the talk of war in the Baronies seriously when I set out to visit them. They might be populated by a backward and barbarous lot, but what people could make war on themselves for two-score years with nary a pause? Surely, I told myself, it was just the odd Warband, or petty lords divided by ancient insult having a whack at each other once or twice a summer. The first three roadside villages I came across put the lie to that, with their burned fields and their missing sons and lost daughters. Soon, I came to believe that their war was not simply about a throne without a king. After all, their last king had been dead since soon after the war began. Rather, their Succession Strife had become the life's work of generations that had been taught nothing but war. – Excerpted from A Bard Abroad, by Andus Carrek. Deep within wet, salt-kissed stone walls, a man in blue robes worked in a room without candle, lamp, or lantern. The only radiance in the room was a dark, blood-colored light emanating from underneath the man’s fingernails. The dim light moved along in slow trails with his fingers, offering little illumination and no heat. He was bald and thin, with drawn cheeks and eyes hidden in pools of shadow. His sight was not, it appeared, hampered by the dark. The same could not be said of the slim boy that stood at his side. He was similarly robed and bare-headed, but fumbled for things in the darkness. For tools, mostly, all of them sharp, and more than one command to fetch ended with a bleeding finger. The bald man bent over a table upon which a lamb bleated and shat, squirming to get out of the grip of his left hand. "Hook." The boy peered into the darkness of the instrument case, thought he saw the right shape, reached out, pricked his finger. He bit away a curse and reached more carefully. "The hook. Have you not learned the Seeing Dark yet, idiot boy? It is right in front of your face." The man's voice was smooth, nearly a hiss. The boy found the hook, his fingers only just managing to avoid the wickedly sharp point, and brought it quickly to the extended hand. "I do not know what Gethmasanar sees in you. Great potential, he tells me. The most powerful will he has ever touched, though it all remains unconscious." The man took the wooden handle of the hook and, almost casually, plunged it into the soft, bare belly of the lamb. The frenzied bleating became awful, magnified in the silence of the otherwise still room. He twisted once, twice, then yanked. A huge stain, dark even in the darkness of the room, pooled in a hollow in the middle of the table upon which the man worked. The lamb quickly grew still, though its pitifully diminishing cries left the boy trying, and nearly succeeding, not to flinch. His eyes betrayed him, nearly closing as the muscles of his neck tightened. "So he tells me, Bhimanazir, you must teach the boy. And yet you still quiver at the haruspicy table." He leaned forward over the dark mass he had spilled on the table and pulled the hook free; where the gore touched his fingertips, it smoked. Whatever it was that Bhimanazir saw, he did not like, for he howled his disapproval, and mashed at the spilled organs and entrails with the flat of the hook until the table was spattered with pulped innards. "No. It must be wrong. This cannot be." "What does it say, master?" The boy's voice was cautious without being obsequious. He did not, in truth, wish to know the answer. "What all the rest have said," the sorcerer bellowed. He turned and seized the boy with bloodstained fingertips, and the lad felt heat rising from them. "All of them. Death, they have said. They have said that death comes." Not a moment too soon, the boy thought. "Go upstairs. To the guards. Tell them to bring me one of the new maids." "Are you defying me?" Bhimanazir's voice was low, and the boy knew, very dangerous. "Go and tell them to bring me a woman. One who has borne at least three children. Be quite clear on that. Go now. And if you question me again, Gethmasanar be damned." The boy felt the vile, insidious touch of one of the sorcerer’s fingertips through his thin robe. "I will boil the blood in your heart. Go." The boy knew this was no idle threat, and quickly, his bare feet slapping the stones, he vanished. The sorcerer turned back to the table, taking a deep, steadying breath. "The lamb was wrong," he thought. "The lamb was wrong. And the goat. The cat. And the birds. All wrong. Death does not come. Death does not come for such as me and my kindred. Not now. Not ever." Hundreds of leagues away from the haruspex lurking in the bowels of one castle, two men shared the late afternoon watch on an outer tower of another. Where the first had been the color of sand and stood facing a great bay leading to a greater sea, this one was a mottling of greys and browns that stood high on a mountainside, commanding multiple views of three ascending paths, its fourth side a sheer cliff face. The men guarding the particular tower wore, like others dotting the walls and gates, dark grey tabards over mail, and they carried spears and heavy shields. Shields and tabards all bore the same device, a black peak outlined against the grey. Leaning against a crenellated wall, they watched a figure descending one of the paths, leading a string of animals. Even from this distance, one of the animals stood out, an exceptionally massive grey destrier. "What if the baron turns us out to search for him?" one man muttered to the other. "I'll not go," said the second. "Fine, I'll go," he admitted. "But I'll make no haste." The sound of boots from the stairs leading to the top of their tower reached their ears, and they turned, straightening spears and shields much the way they straightened their backs. The man who emerged was pale, wearing a black-and-silver barred surcoat over riding leathers, with a finely wrought sword belted at his right hip. Twin braids of fine blonde hair framed his face. Their spears closed against the shields at precisely the moment their booted heels met. The knight returned their salutes with a faint wave and joined them at the wall. He wasn't winded from the rush up the stairs, but a sheen of sweet glimmered on his forehead. The watchmen fairly streamed with it beneath their mail and arms. The pale knight drew breath as if to yell. The taller and older of the two soldiers cleared his throat. "Begging pardon, m'lord of Highgate, but he'll not hear you from this height. Leastways, not so he could answer you." The knight sagged a bit against the wall, but soon he stood upright again. "He would not turn back anyway, Bannerman Lamarck," he said. "No m'lord," the older soldier replied, "I don't think he would." "Two men tried to detain him at the main gate," the knight added, watching the figure grow smaller in the distance. "An order got to them fast enough, to try and stop him alive and unhurt, no blades." One soldier's eyes found the other's, and they winced in near unison. "How did that end, m'lord?" asked the younger soldier. The knight grunted. "How do you think it ended, Chosen Man…?" "I’m Ingil, m'lord. Ended poorly, I suppose." "Nothing was broken, or so the chirurgeons thought. But neither will be fit for duty for a day or two," the knight replied. "Sounds like they may have gotten away lightly, m'lord," muttered Lamarck. "Aye. On his way out of the gate, they say he made sure to explain that he bore them no ill will, but that he could not be detained." Ingil sighed. "M'lord, that's two knights gone this year, and it's not yet high summer..."
"I wouldn't count Sir Casamir a great loss, Chosen Man Ingil," the knight replied. "Yet any loss is regrettable." An uncomfortable but brief silence prevailed, until finally the knight sighed and pushed away from the wall. "Dammit, Ally," he muttered, as he headed for the steps. Further muttering was lost to the two soldiers, who slumped and leaned on their spears. The southern border of Barony Oyrwyn was all hills, valleys, and occasional mountains. Which made it perfect ambush country. The lone figure currently crossing that border, atop one horse and leading another, along with a mule, avoided cresting any hills. Likewise, he never descended to the bottom of any valley he crossed. There was only so much caution he could take, though. Soon, he knew he was being watched. Nothing for it but to keep riding, he thought. His current course cut across a hillside. He meant to follow it down around its rounded, western edge, which would lead him to the north bank of the Ash. Then cross it and leave Oyrwyn behind, he thought, calling to his mind a precise and detailed map of the area. On it, he knew the fords and the passes, trails for cattle and game, the narrow spots and the steepest hills. What to defend, where to attack from, how fastest to move an army across it, or how to keep an invader mired in it. So when he spotted six armed men coming around the side of the hill he was making for, he stopped and studied the ground a moment. Too steep to risk a hard run on the grey, he told himself. He narrowed his dark blue eyes, nearly squinting, at the approaching men. No pole-arms or spears, he noted, though there was an assortment of knives, hand-axes, and one short sword. The mounted man was unarmored, but armed with a grey-faced shield slung off the pommel of his saddle and a long and heavy-bladed sword strapped to his back. When he decided to stop and await the men, his hand fell to the hammer at his side. It was an ugly thing, a heavy dull maul atop nearly two feet of wooden haft, the last foot or so of which was bound with iron rings riveted into the oak. He rested his hand on the hammer’s head for a moment, feeling the warmth the metal had soaked in. The day was hot, brutally hot, though not yet midsummer. Not going to be any cooler in the lowlands, he reminded himself. With a snort, he drew out the hammer and laid it across his legs, resting his right hand lightly on the haft to keep it in place. And he sat atop his palfrey and waited. This seemed to give the other men pause; they stopped and conferred briefly, most appearing to defer to a tall man in the middle. It gave the lone horseman time to study them. The places where armbands had once been tied securely around their upper arms, or where stripes been sewn onto their sleeves and cut off, were obviously discolored. One still wore a red tabard, a few ragged holes pocking it where insignia had been ripped off. Deserters, he thought, with derision curling his lip. What does that make you, then? he scoffed to himself. He turned in the saddle and looked behind at the impressive mountain range in the distance, imagining the roads that picked through them, seeing in his mind's eye the towers that guarded them, the keeps and halls and villages they led to. Then he turned back to face the group of deserters, squaring his shoulders. At a distance of ten yards or so, the men drew to a halt, and the tall one took a step forward. His shoulders still had a military bearing, and his back was straight, but the rest of him looked shabby, and a patchy black beard had started filling in his cheeks. "Good afternoon, friend traveler," the man began, his voice inflated with feigned joviality. "What brings you out t' this country?" The mounted man thought for a moment, his lips pressed into a thin line beneath a nose that had been broken more than once. Enough times, indeed, that it had started to splay to the left side of his face. "Traveling," he finally said, calling out in a deep, polished tone. "We can see that well enough. Travelin' t'where?" Another pause. "West, and then south." "So to Delondeur, then? Wouldn't advise it, friend. Lots of trouble in that part of the barony these days." "Reavers," the man said. "Slavers, some say. Deserters gone bad. That sort of thing." "What other kind of deserter is there?" A thick, tense pause was followed by reactions among the men that ranged from angry, to quiet, to the one in the red tabard dropping his gaze to the ground. "Maybe you take a look at yerself and answer that," the bearded spokesman finally shot back. "Maybe prove ya've worth by sharin’ wi’ some fellow...travelers." "Well, yer mounts. Why d' you need two when there's but one o' you? And all those bags look heavy. Too much for one man to carry." "I think I will be keeping both mounts. And the bags," the mounted man replied. "Big grey looks worth a lot." "You will find that he is worth more than you are willing to spend." "Wasn't lookin' t' spend anything, come to it," the bearded man spat. "But you can still walk away. Cold, you could still ride. On the mule." He looked back at the men behind him, forced a laugh. Most of them chuckled with him, nervously. "I think you will find that you would spend quite a lot," the man replied. He lifted the hammer up with his right hand, extended the head, and pointed it straight at the bearded man. “Y ’reckon pointin’ yer hammer at me's goin’ to ‘ave me pissin' my pants?" "Just measuring my distance," the man said, lowering the hammer to rest against his leg, then adjusting his grip, settling his fingers a few inches above the bottom of the haft. "Are you daft? There's six of us and one o’you." The bearded deserter's voice sped up and rose in pitch. "I can count," the man replied, his voice deep and calm. "How willing are you to make it five against one?" "You're dreamin' or you're mad. What're ya, some great knight out of legends, able to kill half a dozen brigands wi’out breaking a sweat?" "Well," the man said, "I am already sweating, so that rules out one part of the legend. And I do not imagine I can kill all of you. But what I will do," he said, raising the hammer and pointing it again at the bearded man, "is be sure of you." "My lads'll ‘ave you," the man warned, shifting his feet, trying not to glance behind him at the others, who seemed altogether less ready for action than he did. None had seized a weapon or spread their feet into a readied stance, and one had started to edge away from their spokesman. "So they might," the horseman allowed. "But you and your…lads…have neither bows nor spears, which means getting good and close. I may not be on my warhorse, but this little one will still give me height and speed against a man afoot, and I will put my hammer through your skull like the dull end of a breakfast knife through an egg shell." His warning hung in the hot, close air a moment. He began to tense his thighs against his saddle, started to lift his hammer. One of the deserters blurted out, "You've knives just for breakfast?" The mounted man laughed, though it was a dry and humorless sound. "Some do," he replied, but, with the laughter, the tension seemed to slip away. One of the other deserters slapped at the one who'd spoken, and the bearded leader turned to face them, glaring. It was an opening, and the mounted man seized it. "Listen. Traveling in this heat is thirsty work," he called out. "I am willing to trade you a full skin of wine and a sack of biscuit for more of the news you spoke of. And nobody has to die." "We could take all your wine and your biscuit," the bearded one muttered darkly. "I'd rather be one of six splittin' the drink than dead while three do it," one of the other men countered. "Your man sees sense. I would rather kill none of you. Hot though it is, I have no wish to go to the Cold today. I doubt you do either." If the bearded one wasn't ready to relent, his men were, and he could sense it. "Fine. We'll 'ave the wine." "News first, then I leave the wine and the biscuit and ride away." "Fair enough. I don't know all o' the whys, but seems like Delondeur has let the whole north of his barony go to seed," the bearded one said. "Word is that some slavers are workin' the villages, takin' what the press gangs haven't got already. Villages up here've not seen a green-hat or a baronial messenger in years anyway, just men in armor rounding their sons up to fight," put in one of the others. "And he's engaged down at the southern tip of Innadan and Telmawr, and with islandman pirates at his back." The bearded man picked up the thread without missing a bit. "Cold, they even say there's a town out where the Ash gets huge that's calling itself its own barony now." "I heard there was a den of robbers and river pirates out there," the mounted man said. "Been rumors of it now for twenty years or more. But a town?" "Aye," the bearded man said. "They're buildin' walls, wearin' livery. All that rot." "I have a hard time believing that Baron Delondeur could let it all go that far. And I thought he made peace with the islandmen?" "Those in lost Vyndamere, sure,” the red tabarded man replied. “Rammed it right down their throats. And he's put enough weight in the pockets o' real islandman swords-at-hire t' call it peace, I s'pose. But make good wi' one batch and another'll come along, shoutin' and burnin' and killin' for the Sea Dragon," replied the man in the red tabard. The less Lionel is looking this way, the better chance I have to get across his barony, the horseman noted silently. Then, cynically, needling himself, To get where? "Well," he said aloud, "it is west and south for me no matter what. There are still some villages across the Ash, aye?" "Might be. Might be that some of the villages that are standin' today'll be burnin' tomorrow," the bearded man said. "West and south it is anyway." The horseman slid down from his saddle, hammer still in hand. He walked to his mule and rummaged in the packs, pulling free a small sack and a bulging skin. He set both down on a sun-warmed rock, stood, took his saddle, and said, "I shall be off now." "You might be ridin' t’ yer grave," the bearded one said, trying to keep one eye on him and one eye on the food. "Safer up here in Oyrwyn, most like. Plenty of places t’ get lost in all that mountain." "For you, maybe," the man said, as he gathered up his leads and gently nudged his palfrey back into motion. I could never get lost up there, he thought. "Thanks for the food an’ drink...you got a name?" "You are welcome to it. And I do." "Goin' t'let us know it? I'm Malken." Silently, the man rode off, giving the deserters a wide berth, descending further down the hill than he would've liked, but round it all the same. The lone horseman pushed on as far as he could before nightfall. The day was long and the sun stayed with him, so he had a good view of the Ash River valley as he tied his animals up for the night and began brushing them down. He had found a camp at the thickly-wooded top of a lone, rounded hill. He knew it as a good place to set bowmen who wanted to harass a host heading north. In the distance, as the air around him darkened, he could see an unusually bright glare of flame, and the deserter's words came back to him. "Standing today, burning tomorrow," he muttered. "Or tonight." He stood and watched the distant flame for a while. At least he was a full day from the village that was burning now. And that's if I give the larger towns a miss completely. He studied it a moment more, then nodded faintly. "Good a place as any to get lost, I expect." He turned back to his own meager fire, made more for the form of the thing than anything else, settled his back against a tree, laid his hammer over his lap, and slept lightly, fitfully. A ghost-glow of the distant fire lingered on the backs of his eyelids most of the night. Continue the story in Paladin: Ordination.